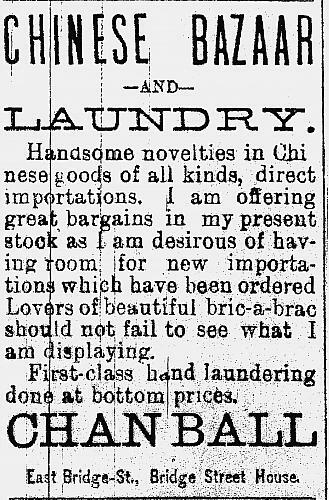 The first Chinese residents of Grand Rapids were three men working in the laundry business ca. 1875. Wau Lee and Ah Tun were at 19 Canal St. 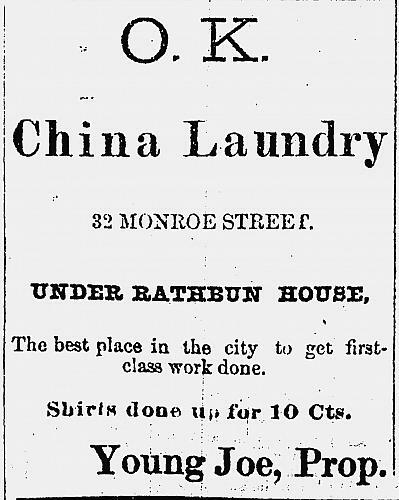 Lung Sam operated his O.K.Laundry under the Rathbun House, an hotel located at 31 Monroe, until 1880 when Fee(Fu) King is listed as the operator. After 1880 Young Joe became the owner of the Rathbun House laundry. In 1889 Lam Fook, the proprietor of the O. K. Laundry who had lived here for two years, was found dead in his "dark, damp basement room by his partners, Wong Young and Lee Tsee." His belongings included a certificate of deposit for $100, many letters, a brass tobacco pipe, a bag of tobacco, and a few trinkets and charms. 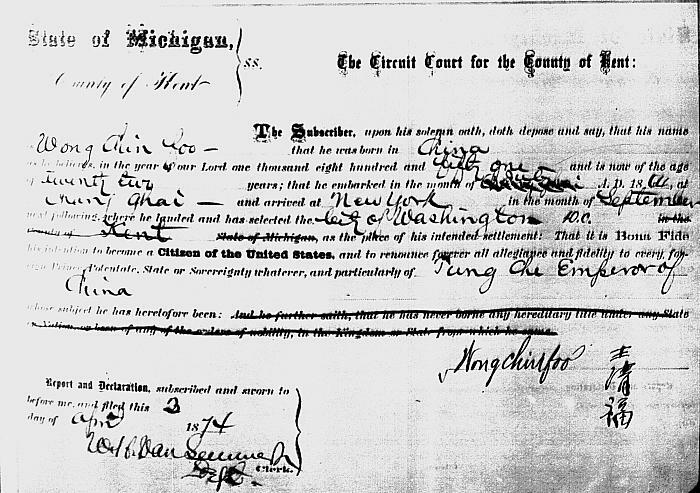 Wong Chin Foo, a notable Chinese lecturer who visited Grand Rapids in 1874, was not a resident but obtained his citizenship papers here on April 4, 1874. He claimed to be the first Chinese in the United States to be granted citizenship. He returned here in 1880 to lecture again. 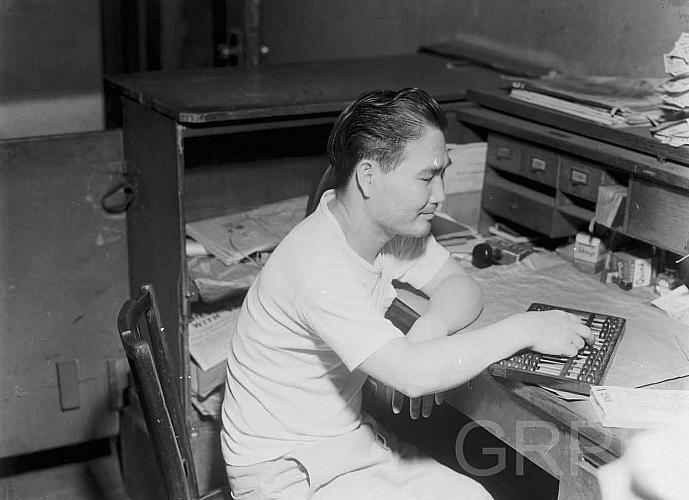 He made his home in New York City where he ran a bi-lingual newspaper, the Chinese American, and advocated for the rights of his fellow immigrants. He was founder and secretary in 1892 of the Chinese Equal Rights League of America. The Grand Rapids Evening Leader mentioned in 1884 that there were six to eight Chinese in the city. Even though they were so few, as early as 1876 the Jan. 22 issue of the Grand Rapids Times made note when Jo Sung, Ah Ling, and other "washee men" celebrated Chinese New Year. The press had difficulty with Chinese names and often misspelled them so it's possible they were referring to Young Joe and Ah Tun. Almost every year fascination with this unusual New Year inspired the newspapers to note this event, who attended, and what they did to celebrate. The only Chinese woman in Grand Rapids was the wife of Chan(g) Ball. The family arrived here around 1885, and like his predecessors he opened a laundry. The Dec. 18, 1886 issue of the Grand Rapids Eagle noted the birth of the first Chinese child in the city, a 5 lb. boy, and the second son for Chang Ball and his wife. A third son was born in 1888. A year later Chang Ball added to his laundry the first exclusively Chinese store in the city featuring items imported from China. The newspaper reported in 1889 that the population of the city now included a dozen Chinese. Chan Hoy arrived in Grand Rapids in the mid-1880s and was importing goods from China, mainly fireworks. In September of 1902 he opened an elaborate Chinese restaurant, the Hong Far Lo, at Pearl and Canal (Monroe) on the second floor. He brought a cook, Lie Choo, from San Francisco, and an assistant cook, See Lee, from New York. By now there were thirty Chinese men in the city--one-third had arrived in the last few months--and fourteen were employed by Chan Hoy. He owned another restaurant in Grand Rapids plus two laundries, a laundry in Holland and one in Grand Haven. He was one of the wealthiest Chinese in Grand Rapids. 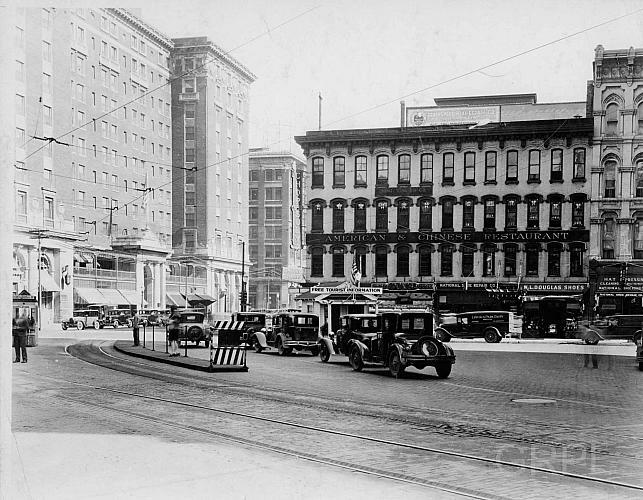 Chan Tai Wo, popularly known as "Charlie Chan" and cousin to Chan Hoy and Charles Young, operated the Tea Garden Cafe on S. Division for twenty years. When he died in 1943 at age 66 he left an estate worth $126,000 and no will. His widow, Chan Jong Sai, son, Chan Yo Dean, and a daughter, Liu Chan Hong Wing Ham all resided in China near Canton. 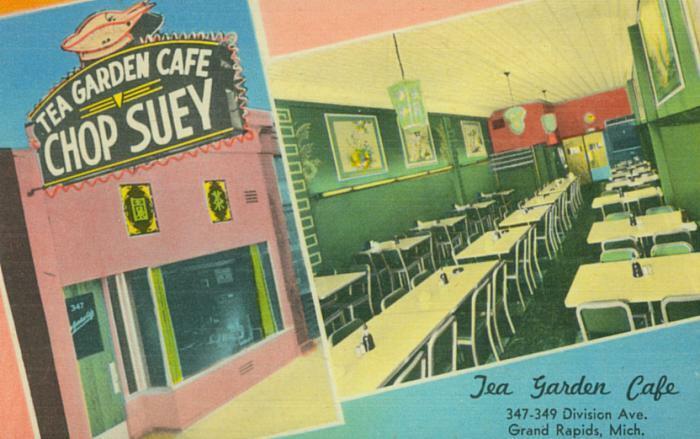 Some of the early Chinese residents in Grand Rapids were married, but had wives in China who were unable to come to the U. S.
This episode shares the story of Chan Hoy and his quest to bring Chinese food to Grand Rapids for the first time ever in 1902. Broida, Marian. Projects About Nineteenth-Century Chinese Immigration. Marshall Cavendish Benchmark, 2006. Chin, Ko-lin. Smuggled Chinese:Clandestine Immigration to the United States. Temple University Press, 1999.